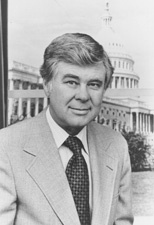 John David Melcher (September 6, 1924 – April 12, 2018) was an American politician of the Democratic Party who represented Montana as a member of the United States House of Representatives from 1969 to 1977 and as a United States Senator from 1977 until 1989. Melcher was born in Sioux City, Iowa; his paternal grandparents were from Germany. He attended the University of Minnesota before joining the military. He served in the United States Army during World War II, and participated in the D-Day Invasion of Normandy with the 76th Infantry Division in Europe during World War II. He was wounded in action in Germany and awarded the Purple Heart, Combat Infantryman's Badge and the Bronze Star. Melcher married Ruth Klein in 1945. They had six children. He graduated from Iowa State University in 1950. Later he moved to Forsyth, Montana, and established a veterinary clinic. Melcher served on the Forsyth City Council. He then served as mayor of Forsyth in 1955, for three terms. In 1960, he was elected to the Montana House of Representatives for Rosebud County. In 1962 he was elected to the Montana Senate. He was elected to the United States House of Representatives by special election on June 24, 1969, to fill a vacancy created when the incumbent, Republican James F. Battin, resigned to accept an appointment to the Federal bench. Melcher was re-elected to the three succeeding Congresses and served from June 24, 1969, to January 3, 1977. In 1976, he was elected to the United States Senate to succeed retiring Democratic Senator Mike Mansfield. Melcher was re-elected in 1982 against Republican Larry R. Williams. Melcher had been targeted by National Conservative Political Action Committee (NCPAC) as potentially vulnerable, and he was subjected to attack ads depicting him as "too liberal for Montana". Melcher's response became a classic of campaign advertising, featuring a shot of an "out-of-stater" carrying a briefcase full of money, followed by a conversation among several cows deploring their intervention in the race. His campaign for re-election in 1988 was unsuccessful; he was defeated by Republican Conrad Burns. Melcher attributed the loss to a lack of time spent campaigning. A wilderness management bill he co-sponsored was vetoed by President Ronald Reagan only days before the 1988 election. Melcher was a candidate in the 1994 Senate election, but lost to Jack Mudd in the primary. Melcher had generally liberal views on environmental issues, but was pro-life and supported prayer in public schools. He was a co-sponsor of the Surface Mining Control and Reclamation Act of 1977, which regulated coal strip mining. Melcher was responsible in 1984 for an amendment to the Animal Welfare Act that required psychological well-being to be protected in primate research. This legislation was praised by Jane Goodall, and in 1987 he was the presenter to her of the Schweitzer Medal of the Animal Welfare Institute. After serving in the Senate, Melcher worked as a lobbyist for multiple organizations, including the American Veterinary Medical Association. Melcher died on April 12, 2018, in Missoula, Montana, at the age of 93. ^ a b c d Reports, News Services and Staff (April 13, 2018). "John Melcher, Democrat who served Montana in House and Senate, dies at 93". Washington Post. ^ a b c d e "Archives West: John Melcher Papers, 1969-1988". archiveswest.orbiscascade.org. Retrieved April 13, 2018. ^ a b "John Melcher". Biographical Directory of the United States Congress. U.S. Congress. Retrieved January 29, 2015. ^ O'Reilly, Jane (November 15, 1982). "No Thunder from the Right". Time. Retrieved October 2, 2007. ^ Barrett, Evan. "Koch bros. and talking cows". missoulian.com. Retrieved April 13, 2018. ^ "Our Campaigns - MT US Senate- D Primary Race - Jun 07, 1994". www.ourcampaigns.com. Retrieved April 14, 2018. ^ "John Melcher Papers, 1969-1988: Biographical Note". Archives West: Orbis Cascade Alliance. Retrieved August 16, 2018. ^ "John David Melcher | Obituaries". The Missoulian. April 19, 2018. Retrieved August 16, 2018. ^ "Schweitzer Medalists" (PDF). Animal Welfare Institute. 2008. Retrieved August 16, 2018. ^ Nolen, R. Scott. "A heart for politics". www.avma.org. Retrieved April 13, 2018. ^ "Former US Sen. John Melcher of Montana dies at 93". Medicine Hat News. April 13, 2018. Retrieved April 13, 2018. ^ "John Melcher, Montana Democrat in House and Senate, Dies at 93". The New York Times. April 13, 2018. Retrieved April 13, 2018. United States Congress. "John Melcher (id: M000635)". Biographical Directory of the United States Congress.